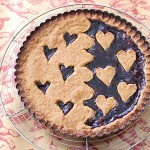 Linzertorte is a very delicious Austrian tart made with a buttery ground nut crust and a sweet-tart raspberry filling. 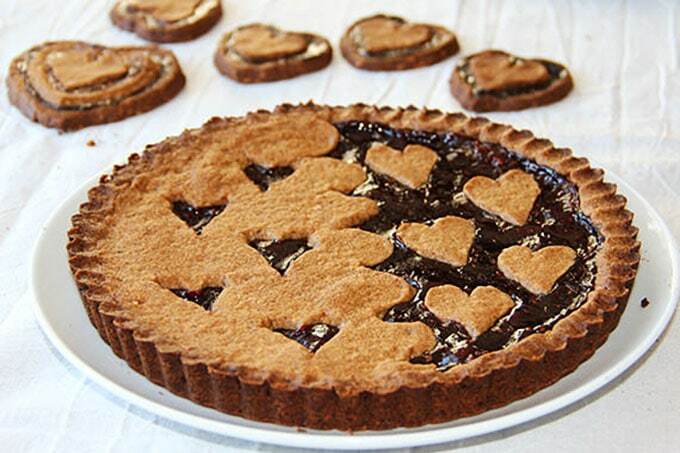 It’s the tart version of Linzer cookies. While hunkering down for winter storm Nemo, I enlisted my husband, Eddie, to help me make a Linzertorte. As I’ve mentioned before, Eddie is our resident baker. He has always enjoyed baking and eating desserts, more than I do. He and my youngest son have the sweet tooth in the family. While I prefer a second slice of cheesy lasagna over a slice of cheesecake. Having said that, there are certain desserts that appeal to me – the ones that are a bit more savory, less sugary, and have exciting flavor and texture things happening. This Linzertorte is a perfect example. The crust is slightly sweet and buttery but what dominates is the heady flavor and crunch of toasted hazelnuts. Add to that sweet and tangy raspberry preserves and I’m craving a cup of hot coffee and a delicious slice.Toasted ground hazelnuts give the crust its wonderful flavor. The traditional Linzertorte has a lattice top, but we were snowed in for the weekend with lots of time on our hands so we decided to get creative. In the end, I picked this yin and yang heart design for Valentine’s Day. Once the dough is chilled, it’s easy to work with. We didn’t have any heart-shaped cookie cutters that were small enough and due to the storm we couldn’t get out to shop around. We were stuck using a free-hand method, but I think it worked out well! This is a delicious dessert for any time of year. You can customize the crust to the occasion. I think the sweet, tart red raspberry hearts couldn’t be more perfect for Valentine’s day! This Linzertorte recipe is adapted from a recipe in the The All Around The World Cookbook by Sheila Lukins. You might also enjoy this recipe for Crescent Almond Cookies, popular in Austria around Christmas. Here’s the Linzertorte Recipe. If you try this recipe I hope you’ll come back to leave a comment and a rating. I’d love to know what you think. 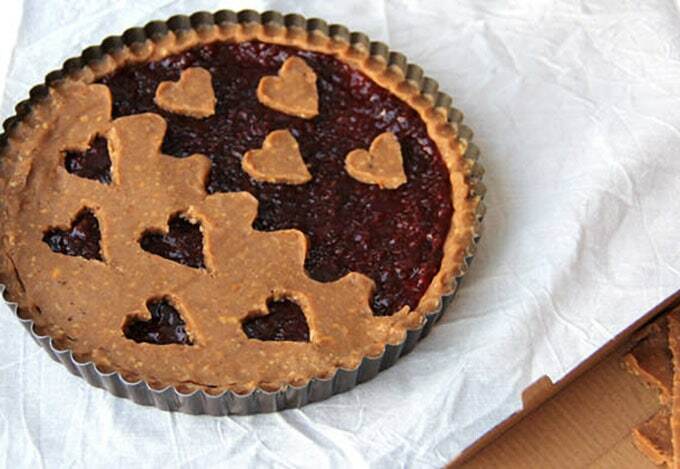 Delicious Raspberry tart with a rich hazelnut crust. Mix dry ingredients In a medium-sized bowl, combine flour, cocoa powder, baking powder, cinnamon, and salt. Set aside. Mix wet ingredients Using a large mixing bowl, with an electric mixer, mix the butter and sugar until well integrated. 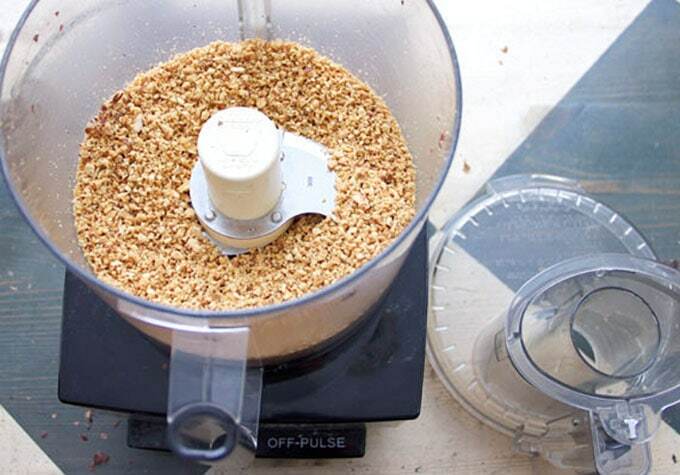 Add ground nuts. Mix to combine. Beat in egg, vanilla and almond extract. Set the mixer on low and add the dry ingredients, 1/3 at a time, stopping to scrape down the sides of the bowl as needed. When all ingredients are fully incorporated, form the dough into a ball, cover with plastic wrap, and refrigerate for at least 4 hours. Take dough out of fridge and let it sit at room temperature until it can be molded (15-30 min) Form dough into a thick log and use about 1/3 of the log to form the bottom crust. (note, there is more than enough dough so feel free to add extra if needed) Press the dough evenly into bottom of the tart pan and up the sides. Crust should be about 1/4 inch thick. You want the crust to go only halfway up the sides of the pan, but in order to get a nice side crust with an even flat rim, press the dough all the way up the sides of the tart pan and then use a finger to push it down to half way. Form a ball with remaining dough. Place it on a large piece of waxed paper and press into a 9 inch disc. Cover with another large piece of waxed paper. With a rolling pin, roll dough into a 1/4 inch thick circle. 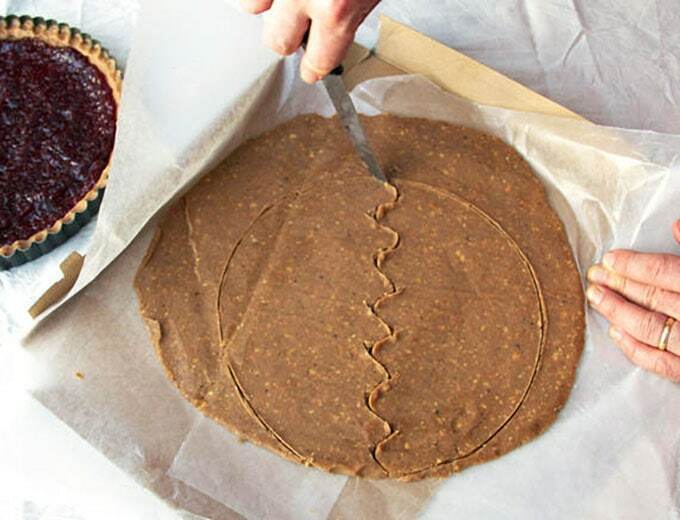 (You can slide a piece of cardboard underneath to help transport the dough) Put the tart pan and the rolled dough into the fridge for about an hour, until firm. Remove tart pan from fridge. Preheat the oven to 350F. Spread jam evenly to cover the bottom crust. Remove rolled dough from fridge. peel off top waxed paper. Cut a circle the size of the tart pan. (you can use the pan as a stencil) Using a sharp knife cut a wavy line down the center of the circle. Peel away one half of the circle and save for making cookies, if you like. 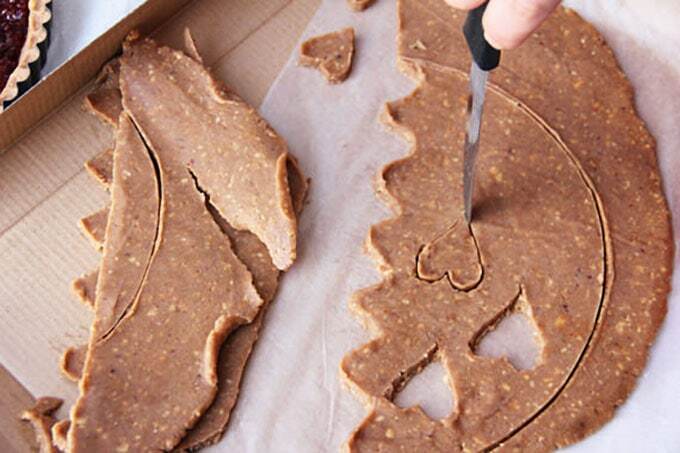 With the remaining half circle of dough, use a heart-shaped cookie cutter or try cutting hearts free-hand. Cut out 5 hearts or as many as you like in a nice design, setting the cut out hearts aside. 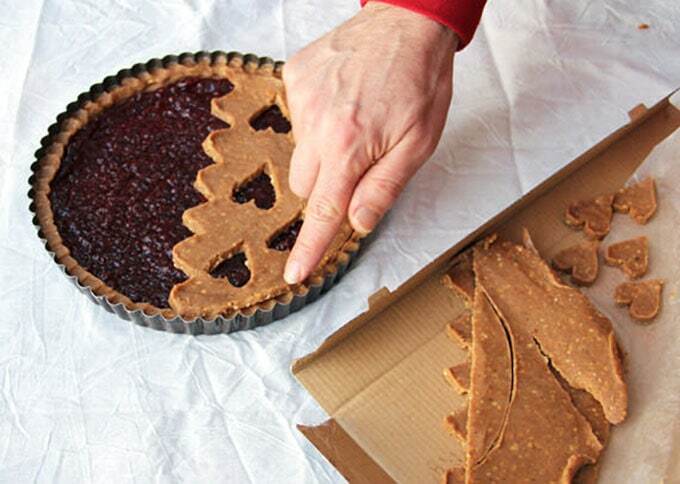 If you need to make any repairs, do so before you place the design on the tart. 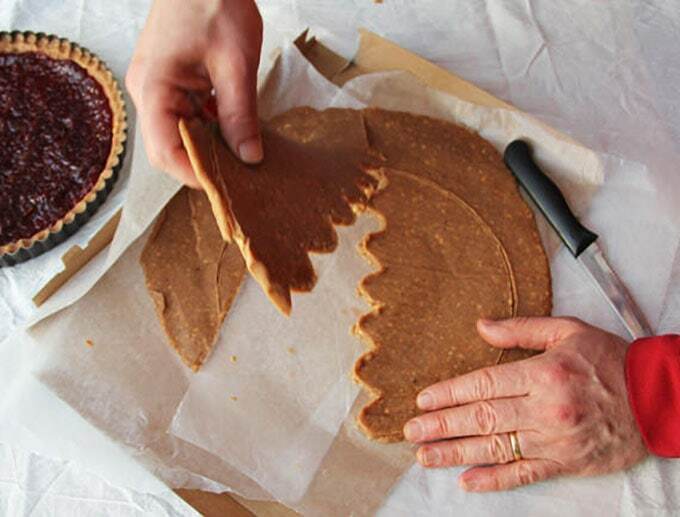 Carefully lift the crust to cover half of the tart, gently joining the crust to the side dough, using your fingers. 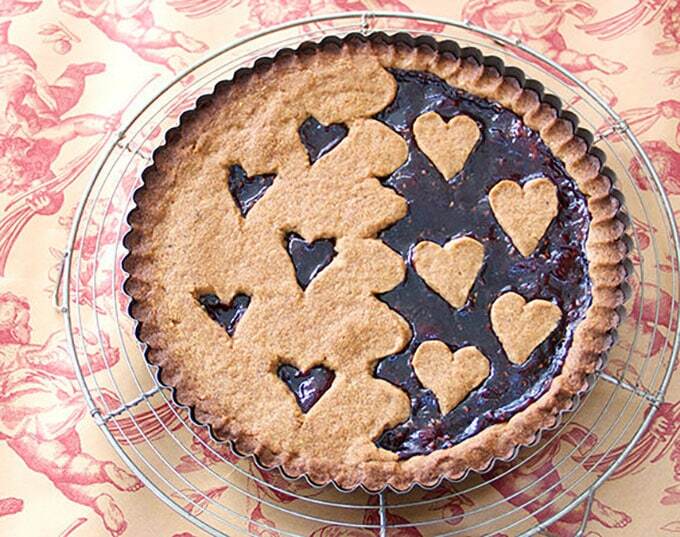 Place cut out hearts on the other side of the tart. Bake in the middle of the oven for about an hour, or until the jam is bubbling and the crust is beginning to brown. Remove from oven and cool on a wire rack for 15-20 minutes. 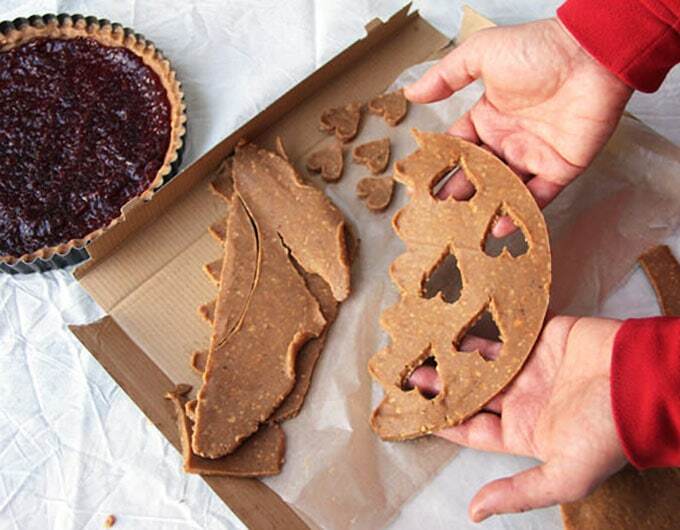 When cool enough to handle, remove tart from the outer rim of the tart pan and cool completely. Since childhood linzertorte has been my favorite dessert. Seeing it in these pictures and reading your description captures why this is so. “The heady flavor and crunch of toasted hazelnuts” combined with the raspberry texture and taste is so special. Thanks so much for these clear instructions. I’ve never made this dessert before, but after reading your post, I think I’ll give it a try. Can Eddie help me too? This is a gorgeous tart!! I completely agree with you on the dessert vs. savory food. With that said, it wouldn’t take much to convince me to eat a slice – looks lovely! Thanks for sharing.